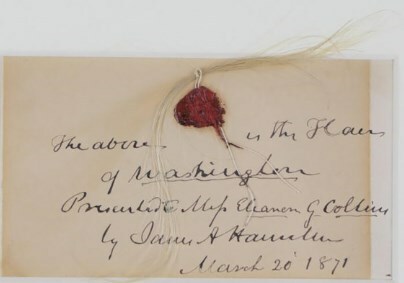 In George Washington’s era, a lock of hair was an ultimate keepsake. Washington’s hair seems to be in a lot of places, even three Topps baseball trading card packs! Recently, it was found in a 1793 book that belonged to Phillip Schuyler, Alexander Hamilton’s father-in-law. 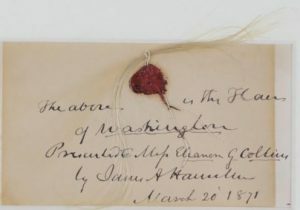 Even more recently, in a Leland’s auction, 5.31-inch locks of his hair were attached to a March 20, 1871 letter from Secretary of State, James Alexander Hamilton (Alexander Hamilton’s third son) to Eleanor G. Collins, in “respect and regard.” The locks were given to James by his mother, Eliza Schuyler Hamilton. The starting bid was $2,500, and the locks fetched $35,763.60 when the auction was completed.